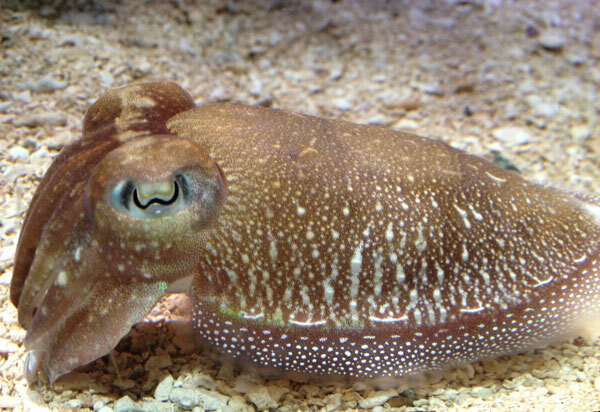 Cuttlefish (Sepia officinalis) are intelligent animals, just like their octopus relatives. They have one of the largest brain-to-body ratios of any invertebrate! Cuttlefish change color and pattern to communicate to other cuttlefish, to camouflage themselves and to warn off potential predators. See video of a cuttlefish changing colors. What’s so amazing about cuttlefish? How about a little something called cuttlebone. The cuttlebone, unique to cuttlefish, is porous and made of aragonite, a polymorph of calcium carbonate. Each species' cuttlebone has a distinct shape, size, and pattern, but they all serve the same purpose, buoyancy control. 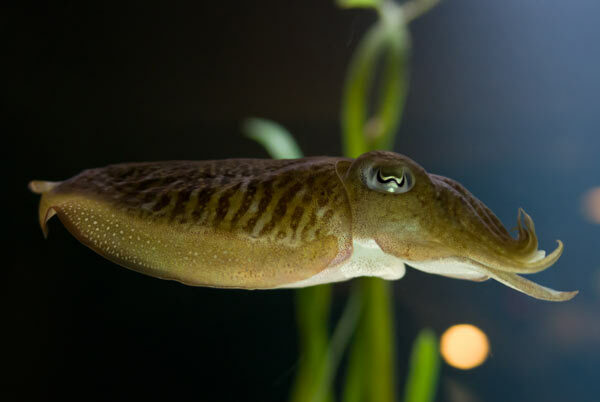 Cuttlefish regulate buoyancy by controlling the gas-to-liquid ratio in the chambers of their cuttlebone via the ventral siphuncle. You may have already seen a cuttlebone before. Pet birds use them for a natural, inexpensive source of calcium carbonate as well as other trace minerals. Jewelers and silversmiths have also used cuttlebone to cast molds. Cuttlefish inhabit the shallow waters of tropical and temperate oceans. They have been observed venturing to depths of about 600 meters. They have an unusual biogeographic pattern involving total absence from the Americas. They are abundant in Africa and Australia, as well as Eastern and Southern Asia, Western Europe, and the Mediterranean. While the common cuttlefish is heavily fished in the northeast Atlantic Ocean and Mediterranean Sea, its populations appear to be stable. But as CO2 emissions lead to acidification of the oceans, this change in pH can lead to devastating effects for oceans and the marine animals that rely on heavily on their ability to calcify, like crustaceans and corals. What do you think this means for cuttlefish whose buoyancy depends on a calcareous structure? Ponder this climate change concern as you observe these amazing cephalopods in their level one exhibit. They're the ones with the eight arms and two tentacles. They share their exhibit with young epaulette sharks, urchins and other warm water animals.